It's blue...you're blue. It's just important! Q. What is Capture the Flag? A. CTF is a unique game that we play in Obsidian on a regular basis. It is different from anything you've ever seen and a blast to play! A. Players are separated into two teams: red and blue and dressed accordingly. They begin in their base where they have to defend their team's flag or go offensive and try to bring the other team's back. As simplistic as this sounds it is very strategic and very action packed. Q. What are the requirements to play? A. Anyone can play CTF they just have to join before the game starts. The only main requirement is you CANNOT bring ANY items with you to the game. This includes anything in your pack or anything on your character. When you enter the arena your character is initialized and everything on his or her body and backpack are removed. * Note: You will lose ALL items on your person when you enter and we WILL NOT replace them if you are too lazy to bank them. A. Anyone can play! Sometimes Broadband even participates. If you are a newbie and don't have any fighting skills to speak of you can still be of use to your team! Defensive Bomber - One of the more useful items you can receive from the item stone is a boom potion or purple potion. When laid on the ground they are very explosive and only require one to be thrown at them to activate a world of pain. Lay these around the flag or at certain strategic positions and when you see someone the other color....bombs away! A. Summon a runestone crystal to the Runestone Chamber and look for the CTF Statue. When you see it double click it to join. If you don't know how to summon a runestone: open your paperdoll (ALT-P), click help and then look for the summon runestone option near the bottom of the menu. Q. What is the jail for? A. Each team has a jail and when they are killed they are sent to their team's jail. Here they have the ability to re-equip before re-entering battle. This also brings another strategic element to the game. The jails only open every few minutes, so if most of your team is dead it will give the other team a huge advantage! Also those in jail are very useful for resupplying their still living teammates. Q. What is the Jail Gate (See Picture)? A. This is an automatic gate that will rise and fall every few minutes allowing for reinforcements. They only stay up for a few seconds so hurry out of jail before they reset! Q. What is the item stone (See Picture)? A. The item stone is the heart for the supplies for your team. When double clicked it will present you with a list of supplies you can acquire. Feel free to use it as much as you like, however make sure you aren't so greedy you miss the jail gate when it opens! Q. How do the flags work (See Picture)? A. There is a red and blue flag and they are located in the heart of each team's base. Your goal is to bring it to your base and walk in the capture portal. Flags can only be picked up by the other team and you need to make sure they don't get captured. If someone has your flag and you kill them, the flag will fall to the ground and a 30 second timer begins. If the flag is not picked up when time runs out the flag will return back at base. If it's picked up and dropped again the timer will be reset. Q. 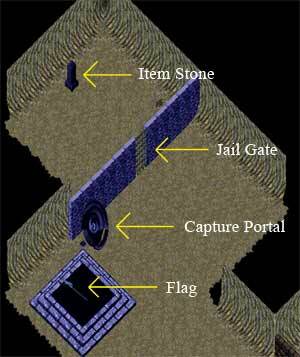 What is a capture portal (See Picture)? A. Capture portals are used ONLY when you have the other team's flag. If you do not and walk into it, you will be immediately sent to jail. Use this if you need to resupply. If you have the other team's flag just run into your team's capture portal with it and you will score! Q. My friends are on the other team! Can I switch? A. Unfortunately not. When you enter the game the teams are automatically assigned to ensure that they are both random and balanced. Better luck next time. Q. How the heck do I quit? A. Once you join the game you cannot leave until it is over. As soon as the game ends golden portals appear all over the map allowing you to exit. If you have to leave mid-game just log off and when you log back on you should see the gates. Q. Someone cast a wall in surrounding their flag! Is that legal? A. This is perfectly legal and an suggested strategic move. By walling the flag off the other team can't get to it unless they bring mages of their own to dispel it. Q. Someone cast a wall in front of me while I was running with the flag! Is that legal? A. Once again this is completely legal and suggested! Q. Someone cast a wall in front of the jail! Is that legal? A. While this could be considered a strategic move, in reality it's really just a cheap way to avoid having the other team lay the smack down on you. Anyone caught doing this will be IMMEDIATELY BANNED from any further events. Q. I have the flag but can't move! A. When carrying the flag you will have random effects used against you. These could include partial paralysis, loss of heath or stamina. This is to encourage teamwork and discourage one person getting the flag on their own.